There are not that many people who care about vintage recordings. It takes the dedicated work of enthusiasts to hunt down old records or Edison cylinders, to restore them and to make them publicly available as part of our musical heritage. But all of this is in peril as a secretive new copyright bill makes it way through congress. Here’s the situation: Some pre-1972 records have slipped into a legal limbo because they may not have any copyright protection anymore. As a matter of fact, there was no real “Federal Copyright” before 1972. So an artist who recorded a song in 1971 might lose his royalties while another performer, who recorded his music in 1973 enjoys Federal Copyright protection. This “unfairness” presumably is at the bottom of a new law called the “Compensating Legacy Artists for their Songs, Service, and Important Contributions to Society Act” – in short “Classics Act. This act would put ANY recording prior 1972 into copyright until at last 2067. Any recording. As in everything. Early Edison cylinders? Copyrighted until 2067. Blind Willie? 2067. The “Kansas City squabble”, recorded in 1929 ? 2067. John Mcormack? Copyrighted. The “Vocal Quartette” performing “Dixie” (see image) from around 118 years ago? You get the idea. This is not what the framers had in mind when they formulated that Congress shall have the power “To promote the progress of science and useful arts, by securing for limited times to authors and inventors the exclusive right to their respective writings and discoveries.” . They clearly understood the way how the sciences and arts progress – by copying, improving and changing the work of previous generations. How would modern music look – if we had it – if the African American communities would have claimed copyright for their invention of the blues? If Strauss’ waltz music would still be strictly copyrighted? We all can agree that scientists and artists should be fairly compensated for their work. But who benefits from performances and artists that have been dead for 70, 80 or even a hundred years? All over the world, all copyrights expire after 50, 60 or 75 years after the death of its creator. Glenn Miller music is in the public domain pretty much everywhere (not in the U.S.) – allowing enthusiasts, librarians, fans to work with and enjoying his legacy. 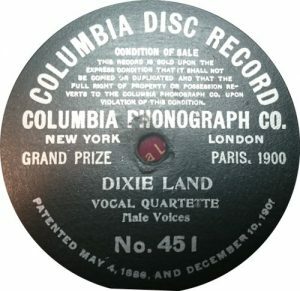 Anyone who , prior to February 15, 2067, performs publicly by means of digital audio transmission a sound recording fixed before February 15, 1972, without the consent of the rights owner, shall be subject to the remedies provided in sections 502 through 505 to the same extent as an infringer of copyright. By the way – if this law passes, the record above will be under a re-newed copyright which is owned by Sony (who else ?). It would be protected until at least 2067 – so it enjoys a whooping 167 years of protection. Do we really think that any person who recorded that record is still alive then? Yet – they call it the “Compensating Legacy Artists for their Songs … act” . I doubt Sony would even be able to track down those who recorded the song back in the days. This law is not about protecting Legacy Artists – it’s about protecting corporations. As it has been before again and again. In the past, copyright in the U.S. has retrospectively been restored. Following the Copyright Act of 1976, copyright would last for the life of the author plus 50 years, or 75 years for a work of corporate authorship. The 1976 Act also increased the extension term for works copyrighted before 1978 that had not already entered the public domain from 28 years to 47 years, giving a total term of 75 years. The 1998 Act extended these terms to life of the author plus 70 years and for works of corporate authorship to 120 years after creation or 95 years after publication, whichever end is earlier. Copyright protection for works published before January 1, 1978, was increased by 20 years to a total of 95 years from their publication date. If this bill passes – vintage recordings can no longer be shared without risking civil- or even criminal prosecution, the restoration enthusiasts will most likely cease to work on those treasures. What good is it to not only find a rare recording, but to work for weeks on its restoration when it can’t be shared and published? This bill threatens or musical heritage. More valuable and rare records will end up in landfills or decay beyond restoration capabilities and we will lose a significant portion of our national treasures forever. Please talk to your congressman or -woman. Please tell him or her that our musical history is under thread. Tell them to oppose H.R. 3301 because the publics interest in our heritage is more important than the few cents performers may gain from the work done almost 50 years ago. Tell them that we already lost thousands of recordings due to age, accidents or other reasons. Tell them time is running out on so many old records and cylinders and that we help to preserve those tunes for future generations. and find your Representative or Senator. This is not a partisan issue. This is about whether or not we value our musical past and support those who are spending their time with the restoration of music that would otherwise be lost forever.